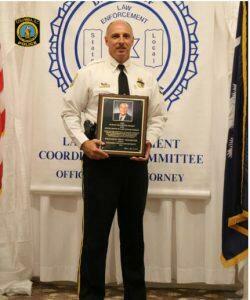 In partnership with the United States Attorney’s Office’s (District of South Carolina) Law Enforcement Coordinating Committee, the South Carolina Law Enforcement Officers’ Association (SCLEOA), and the Strom Thurmond Foundation, the Columbia Police Department (CPD) announces that Chief Skip Holbrook is the humble recipient of the 2018 Strom Thurmond Award for Excellence in Law Enforcement. 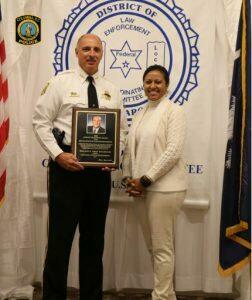 Chief Holbrook was given the honor at the Fort Jackson Officers’ Club at Fort Jackson this afternoon. The Strom Thurmond Awar d for Excellence in Law Enforcement was established by Senator Strom Thurmond in 1983 to recognize law enforcement officers whose performances demonstrate the highest ideals of excellence in professional law enforcement. An annual award is given in each of four categories: (1) City Officer; (2) County Officer; (3) State Officer; and (4) Federal Officer. Chief Holbrook was nominated by his peers and colleagues for his leadership, integrity and achievements at CPD. Advancing 21st Century Policing Project – CPD was one of fifteen law enforcement agencies in the country to serve as a positive example of effective ways to produce a “how to” manual for other police agencies that will include best practices, lessons learned and case studies of the participating agencies. CALEA Accreditation –CPD received its Advanced Accreditation for Law Enforcement confirming that our policies and procedures meet national standards. Front Porch Roll Calls – when police squads host pre-shift rolls calls in communities. Public Command Staff Meeting – question and answer structured meetings to provide citizens with a front row seat to the inner workings of the CPD and discuss crime trends and crime prevention. The SCLEOA SCANA Award for Excellence in Law Enforcement – The award recognizes the efforts, innovative service to the community, efficiency and results of CPD during the past year. Body-Worn Cameras for CPD Officers – requiring officers to wear BWCs while on duty and during calls for service response to provide transparency, accountability and honesty of officers. Tactical First Aid Kits – issued to all uniformed officers to assist injured officers or citizens during calls for service.